The Physics Groupie Blog: Earth Speaks! What would you say to an extraterrestrial? That’s a question that has confounded human beings for quite some time, especially since we began the search for extraterrestrial intelligence. The question needs an answer the moment we detect the first signal from a distant civilization. And just how do we reply? This isn’t an easy question either. 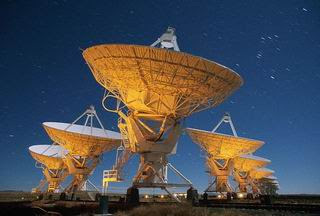 Fortunately, the Search for Extraterrestrial Intelligence (SETI) Institute has started a new project called “Earth Speaks” that asks space enthusiasts around the world to answer the first question and provide possible “first contact” communications when, or if, we ever receive the first cosmic message from the stars. Alright now, I think you all can do better than this, yes? This is a serious project, so treat it as such and give it your best shot. To check out more of the suggested responses posted by other people, the site has a Google map of the world with push-pins indicating posts. Just click on the pins to read the posts. Most are pretty ridiculous and some are rather long-winded. What do you think? Although I’ve followed the work of the SETI Institute for many years and I respect their dedication to the search for alien life, I have qualms about this new project. Yes, it is important to determine how best to reply to an alien civilization once discovered, but my concern is how we can best communicate with them? Here is a good example; an independent Russian group the last few years has sent greetings in Russian and English to targeted stars in our galactic neighborhood. Tell me exactly how an alien race can interpret the syntax and semantics of either Russian or English? It reminds me of the old Stargate SG-1 TV series, where every civilization the SG-1 team visited through the stargate somehow knew English. At least the Star Trek series had the Universal Translator to solve the language problem. But we’re not talking SciFi now, this is for real. I think the message we ultimately send must take into account several factors. First, we can’t just send audible or written natural language. Human language evolved over millennia on Earth and to expect that anyone out there might have a chance at understanding it is unrealistic. Also, so much of human language is tightly woven into the social and cultural fabric of being Homo sapiens and any commonality with a sentient being that evolved independently on another world would be very slim. Yet another factor involves conceptual elements of language. How would an alien race interpret words (or concepts) such as “love,” “morality,” honesty,” or “religion” if those words (concepts) are part of our message? Alien civilization may indeed be very “alien” by any standard we can conceive of and any hope for a successful translation may simply not be possible, at least during the first contact period. So what is an appropriate message then? I think our message should be very simple, something that would qualify us as beings that have mastered the conceptual basis of the laws that govern the universe. The message could be a recognizable series such as the prime numbers, Fibonacci numbers, or maybe the spectral lines of hydrogen. But even sending them the speed of light is subjective to the units of measure used since 299,792,458 m/s is based on the meter which is an arbitrary standard, and the second which is dependent on the Earth’s rotational period. The message should qualify us as having the cerebral capacity to have made basic mathematical and scientific progress necessary for the Human race to be a worthy galactic colleague. I believe this can be achieved without natural language, at least at first. Here is my suggestion for the first message, the first ten prime numbers. We can’t send Arabic numerals (0, 1, 2, 3, 4, 5, 6, 7, 8, 9) unless we send definitions of what these numerals mean ahead of time. We can’t really assume anyone else uses the base-10 numeral system either since that evolved from the number of our physical digits. Aliens with 8 fingers would likely evolve an octal (base-8) system. It is for these reasons I propose the following message as our first contact. Get it? What would your message be?